Weldon is a village of about 2500 people in Corby Northants, noted for its iron and steel heritage. The Corby Steelworks opened in 1935 resulting in the considerable development of its surrounding villages including Weldon which grew rapidly as a result of the opening of the works. 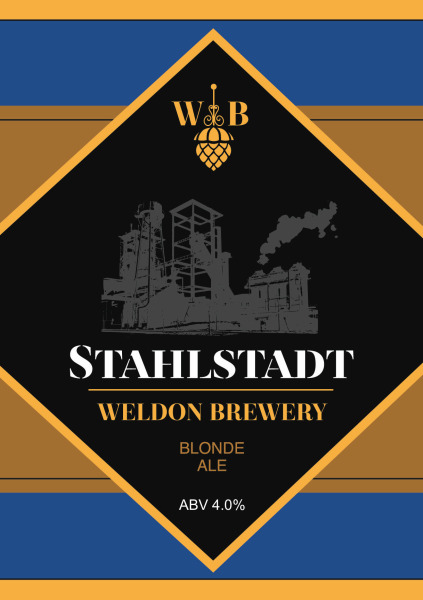 In homage to the town of Corby we named this beer Stahlstadt which means Steel Town in German. We gave the beer a German name because it contains the Magnum bittering Hop from Germany. Stahlstadt is a light and thirst quenching Blonde Ale with zingy lemon overtones from the Citra hops that we use to add flavour and aroma.